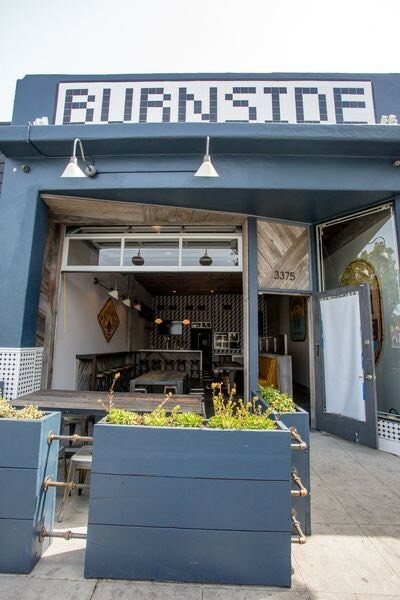 Newly renovated, turn-key restaurant opportunity with existing beer & wine license in the heart of North Park. Prime location in the heart of the 30th & University shopping and dining District. 17' Ceiling Heights and Original Pane glass windows. $600M design-build project adding 1.5M square feet of additional academic space, student housing, and restaurant/retail opportunities. The NTPLLN will be a focal point of the University and will provide expansive gathering places for students and faculty to enjoy the best elements of life on campus. Fully built-out quick service restaurant opportunity in the heart of Bressi Ranch in Carlsbad. Fast casual pizzeria in North County San Diego for sale. Located within a busy shopping center with abundance of daytime/evening traffic. Join Luna Grill and Burger Lounge on the high traffic, hard corner of 4th & University. High ceilings and excellent exposure. Join JuneShine as their new food service operator at the new tasting room and production facility in Scripps Ranch. Existing restaurant fixtures in place for new operator to bring equipment and take over. Extremely rare cocktail lounge available for lease in highly desirable Mission Hills neighborhood. Unique commercial space available for lease in bustling North Park Community. Currently used as an event venue or could be converted to co-working, creative office or general retail. Vaulted ceiling heights throughout the main area with bonus basement space. Turn-key restaurant opportunity with dramatic year over year gross sales and net profit increases. Once in a lifetime location with open floor plan and modern finishes. Flower Hill Promenade is one of North County San Diego County’s premier destination shopping centers, anchored by Whole Foods and consisting of over 165,000 square feet of retail space with an eclectic mix of restaurants and boutiques. Rare turn-key restaurant purchase opportunity w/ full liquor license in emerging Encinitas beach community. Great conversion opportunity for an experienced operator to acquire a coastal restaurant location with existing licensing in place at a fraction of the cost. Cafe/Wine Bar for sale located in one of San Diego's long time affluent uptown neighborhoods. Close to Balboa Park, Little Italy, Downtown as well as many successful restaurants and bars. Wine Bar/Restaurant for sale with existing beer & wine license located in premier Mission Hills location. Newly designed premises with over $2M build-out that includes two bars, large/fully equipped kitchen, state of the art audio/visual features, and expansive outdoor seating. Long term lease in place with over 20 years remaining including renewal options. Restaurant/Retail space available for sale or lease. Building is equipped with built out kitchen, outdoor patio, and storefront renovations underway. Rare Ocean Beach restaurant with Type 47 Liquor License for sale. Main and main type location on one of the neighborhoods busiest thoroughfares. Retail or Creative Office space centrally located in the heart of La Jolla Village. Located nearby to the waterfront and within close proximity to an expansive variety of other restaurants, retailers, hotels, and tourist attractions alike. Coronado is the #6 ranked beach in the US by the Travel Channel , and one of the top 10 beaches by Conde Nast & Forbes. Small restaurant/cafe opportunity with existing beer & wine license located in one of San Diego's most vibrant dining communities. Previous restaurant space for lease located on main thoroughfare in the Bird Rock community of La Jolla. Premises includes existing kitchen infrastructure, grease trap, walk-in cooler/freezer, restrooms and expansive patio fronting La Jolla Blvd. Prime 30th St. restaurant & retail suites with potential for expansive patios. Flexible floorplans to accommodate both small and large users. Rare Type 48, 2am Liquor License allows for cocktails with no food required. Downtown / Uptown Location central to San Diego’s best neighborhoods for nightlife. Entertainment currently permitted until 2am 7 days per week. Unique Cafe/Food use opportunity to service Torrey Pines Court, a Class A office campus located within one of the strongest life-science markets in the nation. Established neighborhood bar with nearly 30 years of history and built-in clientele. Rare grandfathered Type 47 ABC license with no restrictions. Remarkable opportunity to bring your own concept to a 2nd generation Pacific Beach restaurant space with transferable ABC license. Located only two blocks off the beach and nearby to an expansive variety of other restaurants, shopping, hotels, and tourist attractions. Neighborhood restaurant/bar opportunity in beach community with type 47 ABC license and affordable lease in place. For Lease: 2nd Generation restaurant with full kitchen & equipment available. No purchase price or key fee. High ceilings, good foot traffic, prominent signage. 2AM Full Liquor License potentially available. High traffic corner location on main thoroughfare with excellent visibility and street frontage. Open floor plan with festive atmosphere and expansive patio seating. Street level restaurant & retail/creative office space for lease located in the heart of Bird Rock. Premises include functional layout with open floor plan, second floor ocean view offices and large outdoor patio space fronting La Jolla Blvd. Turn-key restaurant opportunity in emerging East Village neighborhood that is BOOMING with new developments. Existing ABC Type 47 license with flexible conditions allowing for alcohol service until 2am indoors 7 nights/week. Fixturized Restaurant with equipment in place and type 41 Beer & Wine license ready to be transferred. Direct lease, no key fee / no purchase price! Turn-key restaurant/cafe opportunity in one of San Diego's busiest beach towns. Located on main thoroughfare with daily traffic counts of approx. 17,000 cars passing by per day. Great location within a shopping center in affluent San Diego community. Fully equipped kitchen with full hood system, grease interceptor, and plenty of refrigeration. Perfect opportunity for an owner/operator. Second generation Restaurant/Cafe opportunity located in a prime location on Girard Ave. No key money fee required. Newly remodeled mixed-use retail property in charming Normal Heights community. One of the top Creative Suites in San Diego is available for Sublease. Original brick walls, concrete floors, high ceiling, giant skylight, two conference rooms, kitchen + open layout. Landmark property that has housed one of San Diego's most iconic watering holds for the past seven decades. Rare restaurant opportunity in highly sought after North County beach community. Existing type 41 ABC license with flexible restrictions. For Lease: Prime site near the main intersection of North Park (30th and University). 20 foot ceiling height, alley access, very cool industrial feel. Tenant Improvement Money is available for a qualified tenant. For Lease: An unmatched corner restaurant, bar, club or retail opportunity on one of the top corners in San Diego County. This site has proven to produce some of the highest sales volumes that San Diego has seen. Located on prominent block in the heart of the Gaslamp and equipped with type 47 liquor license, live entertainment permit, modern interior décor, vaulted ceilings, ample sized kitchen, sidewalk patio seating. Rare opportunity to purchase a cocktail lounge with unrestricted Type 48 ABC license (no food) in hip, up-and-coming neighborhood. Located in the heart of one of San Diego's most prestigious & walkable neighborhoods. Contemporary, beautifully designed restaurant space complete with first class finishes and a full liquor license. Sale-leaseback of single tenant property with enormous lot and ample off-street parking. Buyer rep, cash sale, quick close. Fully built-out restaurant unit with extensive tenant improvements in place. Packaged sale that includes the real estate, liquor license, and existing FF&E. Established local watering hole occupied by single owner for nearly three decades. Freestanding restaurant property on signalized intersection with Type 47 ABC license. Smaller sized fast casual restaurant with significant tenant improvements and beer & wine license in place. Former Boutique space for lease in the affluent area of La Jolla Village. Excellent visibility from the street. Prime retail or cafe site. Modern design with award winning architecture, freestanding building with designated address, and double high ceilings with loft feel. Lease buyout of restaurant space for conversion of new concept. Street level retail/creative office leasing opportunity in the heart of Bird Rock. Premises include functional layout with open floor plan, floor to ceiling glass windows, and +/- 25' of frontage on La Jolla Blvd. Former cafe space for lease in the heart of San Diego's most vibrant community. High traffic corner location with exclusive front patio area and great signage potential. Prime retail, restaurant or cafe site. Tenant rep for relocation of local retail owner. Type 48 licensed bar for sale (no food) with low rent, long term lease, and 1st right of refusal to purchase the property. Buyer rep for urban single tenant restaurant property, negotiated new lease on behalf of owner while in escrow. Tenant rep expansion of regional restaurant group. Tenant rep expansion of regional restaurant chain. Turnkey café space with existing ABC Type 41 beer & wine license for sale in Little Italy, recognized as one of San Diego’s most vibrant restaurant communities. Copyright © 2019 Next Wave Commercial Real Estate, Inc.